Work for KNIME Analytics Platform? Learning about KNIME Analytics Platform? "Powerful & Easy to Use Predictive Analytics / Data Mining"
KNIME offers a delightful blend of power and ease-of-use. It uses a workflow (flowchart) interface. It offers you a collection of icons that represent steps in your analysis. You position each icon in a diagram and connect them with arrows that represent the flow of data or models from step to step. Double-clicking on an icon will open a dialog box allowing you to set the parameters of how that step should run. You can document the workflow by clearly labeling each step, and by color coding entire sections of the diagram. As a result, you can look at another person's analysis and quickly get the big picture of what was done. If a diagram gets too complex, you can select a whole section of it and collapse it into a "metanode" so that one icon then represents all the steps. It's also easy to rerun an analysis on new data by simply changing the node(s) that read in data. Note that KNIME does not have a scripting language, nor does it need one. I particularly like the company's view of open source software. The full desktop version of KNIME is free and open source, regardless of how much data you have. Its closest competitor price-wise is RapidMiner, which is free only if you have fewer than 10,000 cases. KNIME also offers excellent integration with a wide range of other open source software such as: Python, R, Spark, and even ImageJ for image analysis. The server version of KNIME has a commercial license, i.e. not free. The company also sells software to let work groups share node libraries. For example, if I develop a new node in, say, R, and email it to everyone, then when I improve it, I'll have to email it again. Everyone using it would have to edit their work flows, but at least that's a free solution. However, if we purchase the collaboration extensions, I would make a change to the shared node, and everyone's work would be updated automatically. I appreciate having so much control over what to spend on a KNIME solution. For data mining or machine learning tasks, it's quite comprehensive, very similar to what RapidMiner, SAS Enterprise Miner, or SPSS Modeler can do. However, compared to a full statistics package such as R, SAS, SPSS, or Stata, it's lacking quite a few statistical methods. You would have to lean on R or Python if you need statistical analysis rather than data mining. Each new version of KNIME adds more statistics, but it looks like it will be quite a while before they can offer full statistical capabilities. Unfortunately, no one tool offers comprehensive data mining, statistical modeling, and ease-of-use. In the ratings section, I'm giving it full marks as a data mining / machine learning tool. Make sure it has all the methods of analysis you need. If you're into data mining or machine learning, it's probably sufficient. If you're looking for advanced stat methods such as mixed effects linear models, you'll need to run that through an R node. You can use KNIME to solve most any data mining or machine learning problem. "Review Of Powerful Data Analytics Tool "
This best tool for data analysis and integration platform. It provide great help for Machine Learning Concept. It is very easy to learn and it provide very clear block diagram. User can setup their own block diagram also. This software is open source and desktop version of this software is also free.User can also analysis data again and again by just changing node only. This data analysis tool so user must have to learn R language or Python to operate this software. Processing is also slow when data has more than ten thousand data. But this tool is great there is no more defect in that. My recommendation to all student and Who want to research on machine learning they can use this tool for analysis of their data. It is also free for desktop so they do not have to buy that tool. I made one project in machine learning for analysis of stock of different company and it show prediction for next 1 month and i use machine leaning in that at that i use this tool to analysis my data and check whether my project give correct data or not. What Predictive Analytics solution do you use? "Great app. Just some anotations"
The capability to design a big amount of tasks with the software, covering the proccessing of the information all way down. Some of the options are not exactly what i used to need to proccess the information. The fluxes have (on a certain way) a limited amount of configuration options. At my place i use it to proccess the clients information to get some knowledge about the behaviour. "Tools for data science analyis"
It has a simple interface and not hard to learn it with very clear block diagram design for each block By the way, it's easy to debug and has very direct set for each block. You can also set up for the block diagram the way you like and rearrange it anytime you want. data science and data analysis. can use the different algorithm to calculate and predicted the result from the database. The ease of learning the software. for anyone who knows an intermediate amount of MS excel it can revolutionize the way you handle and work with your data. the difficulty to write a concatenation string. Sure, there are js queries and sql that can do that for me, and i could write a function in to create a concatenation, but it seems like a basic function to have a simple node to concatenate text and numerical values. if you have any complications with marginally big data management, knime is a free product that will allow you to breeze through complicated data issues without having to have experience or knowledge of any programming languages. data integration from multiple sources. I use it for SEO and PPC, and often the data sources are varied and obscure, and often improperly formatted. Knime allows me to wade through that with ease. Knime is used for data cleaning, data manipulation and predictive modeling. We do have a lot of softwares for playing around data but everything comes with a price except knime. So, it’s a free platform to manage the data. The only thing that I don’t like in knime software is its interface, it’s kind of old. I generally do all stuff related to data cleaning, data manipulation and building predictive models. The data mining options, in particular the features for analysis using clustering (k-medoids, k-means, hierarchical, etc.) are extremely handy. They remove a lot of middle-man coding! I would appreciate more visualization and exporting capabilities. For instance, the ability to easily visualize the clusters produced with k-medoids, with medoids labeled. Make sure to explore all of the features in the node repository and use the search bar. There is a lot of functionality in KNIME! I have used KNIME to perform unsupervised learning on large time series data. I saved a lot of time by not having to create my own code for clustering techniques. The information on clusters+medoids exported by KNIME was easy to understand. In Knime, each node stores its results permanently and thus work flow execution can easily be stopped at any node and resumed later on. Even though the knime software is very promising and really helps us with alot of things and we love it but the preliminary results are not available quickly if the real pipeling were used. For our company, purchasing knime was a very positive decision. We love the product and the results it gives. For people who are considering purchasing it, i would highly recommend to go for it. It may not be as flexible as other platforms such as tensorflow, but this is compensated by KNME's range of options. Analysis of large sets of data with banking customer information in order to spot profiles, product usage trends and so on. The ease of visualization makes this a great platform to share insights with non-experts. "Nice GUI based data analytics platform"
The best thing of Knime is it is open source and simple GUI based platform which makes it very easy to learn and implement. Although the GUI feature makes it very easy to implement simple models, however on the downside it is hard to build complicated models sometimes. We used Knime for real-time analysis of traffic data. "Knime is a very useful tool for data processing"
I don't dislike it it's really great as it provides features listed above. Machine learning and data analytics . I like that it allows me to create data flows visually and very selectively run steps to throughout interactive models. "Used it for etl, data cleansing, data preparation and analys"
"Intuitive and effective tool for data analytics"
Drag and drop analysis helps faster and effective analysis flow. Graphical user interface makes it easy to plan processes and organize projects. You can work together with teams at the same time. Lack of technical support in the free version. Costing needs to be more economical. Highly effective and easier than other alternatives such as Rapid Miner. Workflow analysis is made simpler and effective with KNIME. We can use it with Python and R as well as integration with Weka. "Good Open Source Software.KNIME can help solve common business problems"
ease of use. drag and drop interface. No need to write code for beginners.KNIME can help solve common business problems like clustering, segmentation, forecasting etc with ease using their drag n drop interface. First time users might find it complicated given the interface as its a bit confusing. KNIME can help solve common business problems like clustering, segmentation, forecasting etc with ease using their drag n drop interface. KNIME can help solve common business problems like clustering, segmentation, forecasting etc with ease using their drag n drop interface. The installation and setup is easy and the screencasts also help make first time usage easier. The user inter-phase looks a bit old school should be revamped to look more up to date. "Not so easy to use"
"An open source analutical platform"
We used this software for data analytics, reporting and integrations. 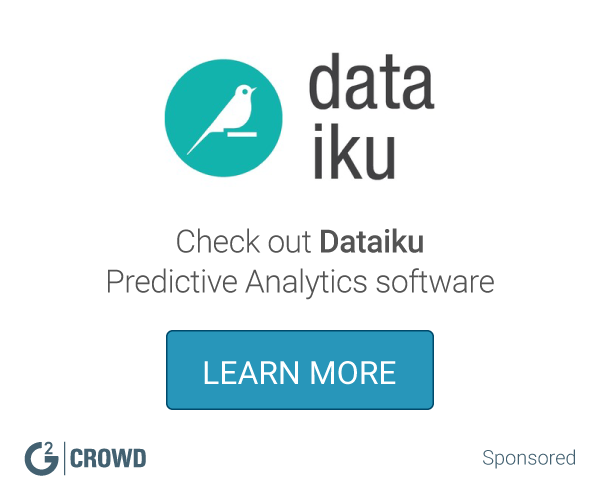 "Great tool for predictive analytics"
Great tool for predictive analytics. The examples provided with the software are a great way to learn this tool by your self. It is really difficult to prepare and clean data. It is great for machine learning. "More features then you an imagine. " Used best for sorting and finding items. Tends to need a faster computer to run. * We monitor all KNIME Analytics Platform reviews to prevent fraudulent reviews and keep review quality high. We do not post reviews by company employees or direct competitors. Validated reviews require the user to submit a screenshot of the product containing their user ID, in order to verify a user is an actual user of the product. Hi there! Are you looking to implement a solution like KNIME Analytics Platform?